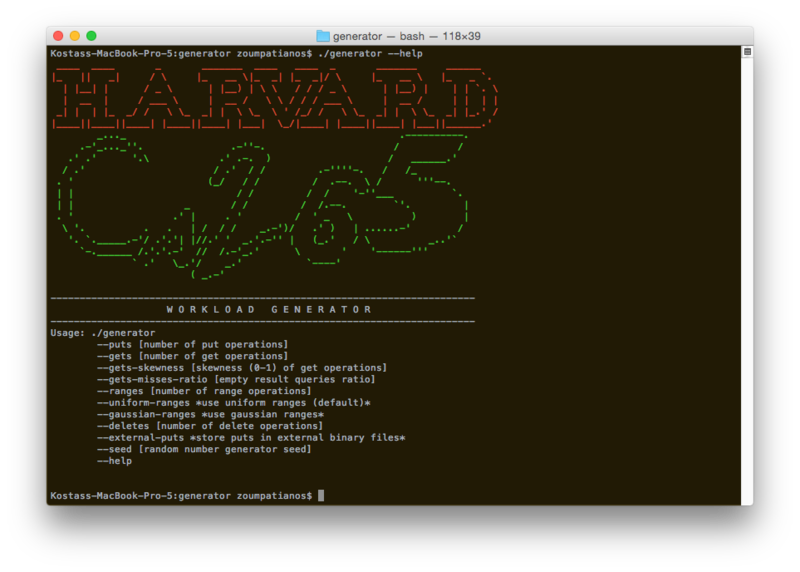 This repository contains the code of a workload generator for an LSM tree. It follows the DSL specified for the systems project of CS265 (Spring 2017). You need the GNU scientific library in order to use the generator (https://www.gnu.org/software/gsl/). Query 1: Insert 100000 keys, perform 1000 gets and 10 range queries and 20 deletes. The amount of misses of gets should be approximately 30% (--gets-misses-ratio) and 20% of the queries should be repeated (--gets-skewness). Query 2: Same as above but store the data in external (.dat) binary files. Query 3: Perform 100000 puts and issue 100 range queries (drawn from a gaussian distribution). Query 4: Perform 100000 puts and issue 100 range queries (drawn from a uniform distribution). You can execute a workload and see some basic statistics about it, using the evaluate.py python script. You need to install the blist library. Note: In Fedora Linux, you might need to install it using: dnf install python-blist. Note: For extra options etc, please look inside the script.